Early departure for La Ensenada, located about 3 hours drive north of Alajuela. This reserve features a combination of lowland dry scrub, dry forest, pastures, and mangroves. Key species likely at this locale include Crested Bobwhite, Double-striped Thick-knee, Sandwich Tern, Pacific Screech-Owl, Ferruginous Pygmy-Owl, Plain-capped Starthroat, Steely-vented Hummingbird, Orange-chinned Parakeet, Orange-fronted Parakeet, Nutting's Flycatcher, Scissor-tailed Flycatcher, Rose-throated Becard, White-throated Magpie-Jay, Banded Wren, White-lored Gnatcatcher, Stripe-headed Sparrow, Streak-backed Oriole, and Spot-breasted Oriole. In addition, Nicaraguan Grackle may be expanding its range into the area as we saw several on our recent visit. Finally, the lodge staff often know where Pacific Screech-Owl roosts near the lodge. Boat trips into the mangroves are prohibitively expensive with less than 4 persons in the group. A boat trip (not included in tour price) may produce Mangrove Cuckoo, Mangrove Hummingbird, and Panama Flycatcher as well as many wetland birds. Night at La Ensenada Lodge. Morning birding the grounds at La Ensenada. Transfer to Monteverde for late lunch there.Afternoon birding the higher elevation forest at Selvatura. The trail there goes through very good montane forest and traverses some 9 ravines by quite stable suspension bridges that provide a view of forest canopy. 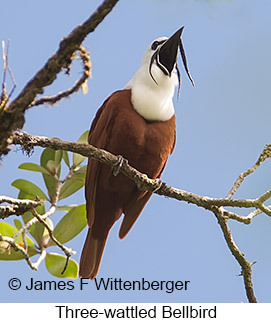 The key species typically seen there is Three-wattled Bellbird, which calls loudly from treetops during nesting season. Other likely possibilities include Black Guan, Buff-fronted Quail-Dove, Resplendent Quetzal, Orange-bellied Trogon, Black-banded Woodcreeper, and White-eared Ground-Sparrow. Night at De Lucia Inn. Morning will be devoted to birding the Monteverde Cloud Forest Preserve. Numerous trails through mid-elevation forest are available, including some fairly level and some steeper with concrete block steps along the way. Numerous species are very possible, including Resplendent Quetzal. Other key species include Buff-fronted Quail-Dove, Orange-bellied Trogon, Red-headed Barbet, Prong-billed Barbet, Blue-throated Toucanet, Plain Antvireo, Spotted Woodcreeper, Streak-breasted Treehunter, Spotted Barbtail, Ruddy Treerunner, Olive-striped Flycatcher, Yellowish Flycatcher, Ochraceous Wren, Bay Wren, Orange-billed Nightingale-Thrush, White-throated Thrush, Costa Rican Warbler, Sooty-faced Finch, and Golden-browned Chlorophonia. The hummingbird feeders outside the entrance attract up to 10 species of hummingbirds including Green-fronted Lancebill, Magnificent Hummingbird, Magenta-throated Woodstar, Stripe-tailed Hummingbird, and the endemic Coppery-headed Emerald. After lunch transfer to the Arenal area. After arrival bird the lodge grounds. Arenal Observatory Lodge. All day birding trails around the lodge. One trail is a very good spot to find the secretive Wrenthrush. Other possibilities of special interest include Keel-billed Motmot, Smoky-brown Woodpecker, Russet Antshrike, Spotted Antbird, Thicket Antpitta, Bare-necked Umbrellabird, White-ruffed Manakin, Stripe-breasted Wren, Song Wren, and numerous tanagers. Night at Arenal Observatory Lodge. A private reserve near Fortuna is a stake-out for several rare crakes, so this morning will be spent there. Early morning visit to a private reserve near Fortuna, a reliable site for secretive rails that come into the open during early morning. 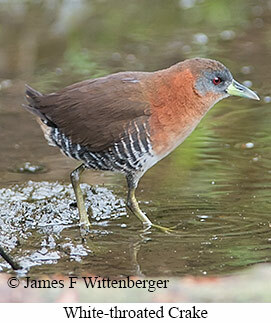 along with the much more easily seen Gray-cowleed Wood-Rail. A trail through extensive forest nearby offers a few additional possibilities such as Olivaceous Piculet, Black-cheeked Woodpecker, and Plain Xenops. Then bird the waterfall trail within Arenal National Park. This trail goes down quite steeply, so an alternative is to return to the extensive trails around the lodge instead. 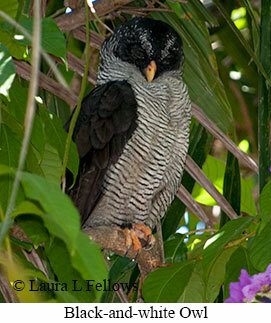 The waterfall trail is a good place to look for Lanceolated Monklet. Afternoon bird trails around the lodge. Extensive forest offers numerous interesting species including Great Curassow, Smoky-brown Woodpecker, White-fronted Parrot, Russet Antshrike, Spotted Antbird, Bare-necked Umbrellabird, Stripe-breasted Wren, Black-headed Nightingale-Thrush, Golden-crowned Warbler, Black-and-yellow Tanager, Olive Tanager, and Yellow-crowned Euphonia. After lunch transfer to Sarapiqui on the Caribbean slope. 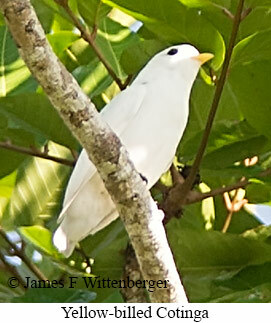 Following check-in birding lodge grounds or nearby sites such as the Sarapiqui River near Selva Verde where Sunbitterns. Night at La Quinta Inn. All day birding La Selva Biological Station, where over 400 species have been recorded. Access is restricted for most groups, but we can usually get exceptional access because our guides are Costa Rican and most have previously worked at La Selva. Birding is along the entrance road, in the clearing around the visitor center, and along an extensive network of trails through primary and secondary forest. It's preferable to bird the forest interior early when bird activity is at its best. Several hundred species are possible and we see different ones on every visit, which is typical when birding in rainforest. Possibilities include Great Tinamou, Semiplumbeous Hawk, Chestnut-colored Woodpecker, Pale-billed Woodpecker, Fasciated Antshrike, Great Antshrike, Black-crowned Antshrike, Black-headed Tody-Flycatcher, Bare-necked Umbrellabird, White-collared Manakin, Crimson-collared Tanager, Golden-hooded Tanager, Dusky-faced Tanager, and many more. If an army ant swarm is encountered, obligate and opportunistic army ant followers such as Bicolored Antbird, Ocellated Antbird, Gray-headed Tanager and Red-throated Ant-Tanager are very possible. Afternoon bird some sites around Puerto Viejo. The main target species there are Canebrake Wren, a split from Plain Wren, and Gray-crowned Yellowthroat. Raptors such as White Hawk, Gray-lined Hawk, and Bat Falcon are also possible. Night at La Quinta Inn. 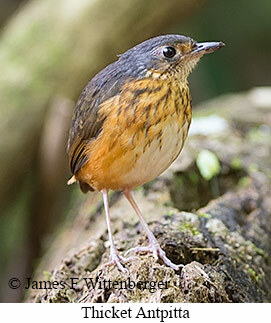 A local guide has a site where he can lure out the very secretive Thicket Antpitta for good viewing and photos. The morning will be spent with him. Various other birds could be seen as well, including Short-billed Pigeon, Crested Owl, which the same guide often has staked out, Great Potoo, Cinnamon Woodpecker, and Pale-billed Woodpecker. After a couple hours with him, continue down the road with a short stop near El Tapir Nature Reserve to look for Snowcap, Black-crested Coquette, Violet-headed Hummingbird, and Blue-throated Goldentail. Then bird one or two trails in Braulio Carrillo National Park. The area around Braulio Carrillo is often very rainy, so this part of the morning is optional. The birding can be very good, especially for mixed species tanager flocks. Some of the notable birds thinclude Tawny-crested Tanager, Blue-and-gold Tanager, Emerald Tanager, and Ashy-throated Chlorospingus. Other possibilities include Yellow-eared Toucanet, Tawny-throated Leaftosser, Sharpbill, Tawny-faced Gnatwren, White-throated Shrike-Tanager, Tawny-capped Euphonia, and possibly a forest-falcon. Lunch at a cafe in Cartago. Then drive to San Gerardo de Dota in the Talamance Mountains. After arrival and check-in, visit the lodge's new hummingbird gardens. Species likely there include Green-crowned Brilliant, Magnificent Hummingbird, Scintillant Hummingbird, and Gray-tailed Mountain-gem. Also likely is Slaty Flowerpiercer feeding among the flowers. Along the road, a stretch of flowers reliably attracts Stripe-tailed Hummingbird. Night at Savegre Mountain Lodge. Morning drive high up the mountain behind the lodge and bird the trail going back down. 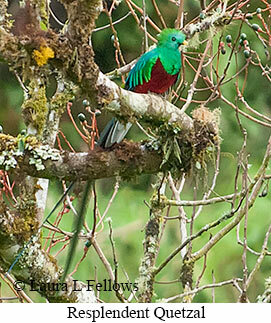 Certainly the prime attraction is Resplendent Quetzal, often seen in the forest there. Other highland species of note include Spotted Wood-Quail, Ruddy Pigeon, Barred Parakeet, Sulphur-winged Parakeet, Lineated Foliage-gleaner, Streak-breasted Treehunter, Ruddy Treerunner, Mountain Elaenia, Yellow-winged Vireo, Black-faced Solitaire, Black-billed Nightingale-Thrush, Long-tailed Silky-Flycatcher, Black-cheeked Warbler, Wrenthrush, Spangle-cheeked Tanager, Silver-throated Tanager, Peg-billed Finch, and Flame-colored Tanager. Afternoon visit the hummingbird gardens at Savegre Mountain Lodge, which attracts a variety of highland hummingbirds. Night at Savegre Mountain Lodge. Optionally, do a very early departure and excursion to Paraiso Quetzales, where they have a program for getting good views of Resplendent Quetzals on a local finca. Then view hummingbirds coming to feeders near Paraiso Quetzales Lodge. This site is the best place to see Fiery-throated Hummingbird, a high elevation species not normally present in the valley. Alternatively, bird the road looking for quetals followed by birding the river trail where quetzals and other highland specialties are possible. Afternoon transfer to Osa Peninsula, arriving by late afternoon. Check the feeders near the lodge for Black-cheeked Ant-Tanager, by far the best place in Costa Rica to view this normally quite secretive species. Night at Bosque del Rio Tigre. 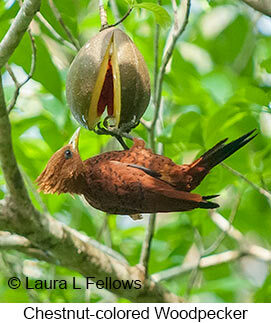 Two full days birding trails near the lodge and nearby Corcovado National Park. An optional early excursion a short distance up the trail above the lodge before dawn one morning may produce the quite elusive Scaly-throated Leaftosser. A trail behind the lodge goes up a ridgeline through good forest before reaching a jeep track used by locals and miners. Birds of note include Gray-chested Dove, Little Hermit, Slaty-tailed Trogon, Baird's Trogon, Gartered Trogon, Black-throated Trogon, White-whiskered Puffbird, Olivaceous Piculet, Golden-naped Woodpecker, Red-crowned Woodpecker, Pale-billed Woodpecker, Red-lored Parrot, Black-hooded Antshrike, Dot-winged Antbird, Chestnut-backed Antbird, Streak-headed Woodcreeper, Buff-fronted Foliage-gleaner, Northern Royal-Flycatcher, Sulphur-rumped Flycatcher, Turquoise Cotinga, Orange-collared Manakin, Black-crowned Tityra, Masked Tityra, Flame-throated Warbler, and Black-striped Sparrow. Raptors such as Black Hawk-Eagle, Ornate Hawk-Eagle, and Tiny Hawk are possible. Back at the lodge, feeding stations outside the dining area typically attract Little Tinamou, Blue Ground-Dove, Scarlet-rumped Tanager, and Orange-billed Sparrow in addition to Black-cheeked Ant-Tanager. 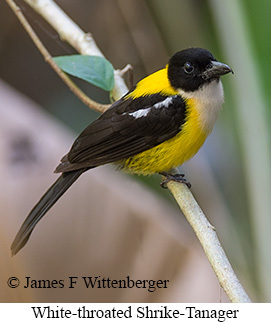 Birds such as Band-tailed Barbthroat, Blue-throated Goldentail, Fiery-billed Aracari, Yellow-bellied Tyrannulet, Yellow Tyrannulet, Yellow-olive Flycatcher, and Green Shrike-Vireo can be seen around the lodge. One afternoon drive into the village of Tigre to look for Isthmian Wren. 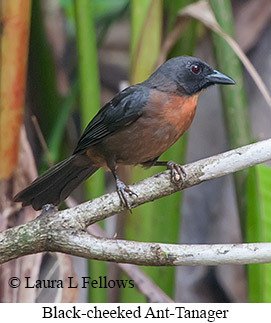 An optional uphill trail into Corcovado National Park outside town offers Ruddy Quail-Dove, Great Antshrike, Golden-crowned Spadebill, Rufous Piha, Red-capped Manakin, and White-throated Shrike-Tanager. At dusk, several Black-faced Antthrushes reliably come out to feed around the compost piles near the lodge. Nights at Bosque del Rio Tigre. Depart early for the Rincon River, arriving by 6:30-7:00am. This site is a reliable place to see Yellow-billed Cotingas, which perch in treetops and fly among the trees on either side of the bridge over the river in early morning. Continue north towards Tarcoles, stopping near Quepos is a good place to find the very localized Spot-fronted Swift along with the more widely distributed Costa Rican Swift. Arrive at the lodge mid-day. Afternoon take a boat trip up the Tarcoles River. Likely species include Fasciated Tiger-Heron, Common Black-Hawk, Amazon Kingfisher, and Double-striped Thick-knee. Around the river mouth are Mangrove Hummingbird, Panama Flycatcher, Mangrove Vireo, and Mangrove Warbler, a color morph of the Yellow Warbler. Back at the lodge, Scarlet Macaws typically visit the gardens in late afternoon, offering close-up viewing. Night at Cerro Lodge. Early morning meet with a local guide near Orotina who has stakeouts for Lesser Ground-Cuckoo, Barn Owl, Spectacled Owl, Ferruginous Pygmy-Owl, and Black-and-white Owl. Early in the season he may also have a site for the very difficult Rufous-necked Wood-Rail in the mangroves near Caldera. Also possible there is Mangrove Hummingbird. An early afternoon boat trip on the Tarcoles River. Likely species include Fasciated Tiger-Heron, Common Black-Hawk, Amazon Kingfisher, and Double-striped Thick-knee. Around the river mouth are Mangrove Hummingbird, Panama Flycatcher, Mangrove Vireo, and Mangrove Warbler, a color morph of the Yellow Warbler. Early afternoon birding lodge grounds or sites around Tarcoles. Later afternoon transfer to Alajuela, arriving before dark. Night at Hotel Aeropuerto.